Twitter are working hard behind the scenes to ensure the President of the United States is heavily censored, according to a senior Twitter executive. 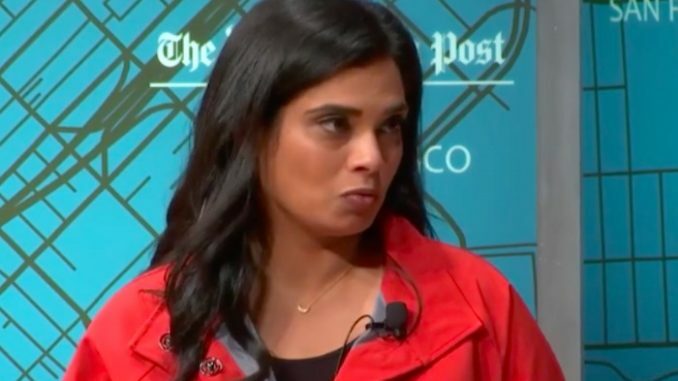 “One of the things we’re working really closely on with our product and engineering folks is, ‘How can we label that?’” said Vijaya Gadde, Twitter’s global lead for legal, policy, trust, and safety. Bigleaguepolitics.com reports: She was responding to a question about whether Trump is immune from Twitter’s fascistic censorship rules, which mostly lead to right-wingers being de-platformed for Terms of Service violations. Gadde was conducting an on-stage interview with Amazon-owned blog The Washington Post, which recently spiked allegations of sexual assault against the Democrat Lieutenant Governor of Virginia, Justin Fairfax. “How can we put some context around it so people are aware that that content is actually a violation of our rules and it is serving a particular purpose in remaining on the platform,” Gadde said. Twitter’s perceived bias against conservatives has been well-documented. Recently, Gadde appeared on the “Joe Rogan Experience” with CEO Jack Dorsey and journalist Tim Pool to discuss the allegations that the company is shutting down right wingers. Pool easily dismantled Gadde’s denials of political censorship. “You have an argument between two people, and you have a rule that enforces only one side of the ideology, and you’ve banned only one of those people,” Pool told Gadde. The ideology in question was transgenderism. Twitter recently banned “misgendering” in its terms of service. Conservatives who point out the biological fact that men are men and women are women can now be booted from the platform, which is what happened to a woman whose account was banned. Rogan interrupted to ask specifically whether it was permissible on Twitter to say that a woman is biologically female. Gadde said that instance was a first strike against the user, to which Pool asked why that would be a strike in the first place. “Again – it’s like the context of the – I don’t, I don’t have all the Tweets in front of me. There were like 10 or 12 Tweets going back and forth and my understanding is that in the context of all of those she was misgendering a particular person,” Gadde said, faltering.